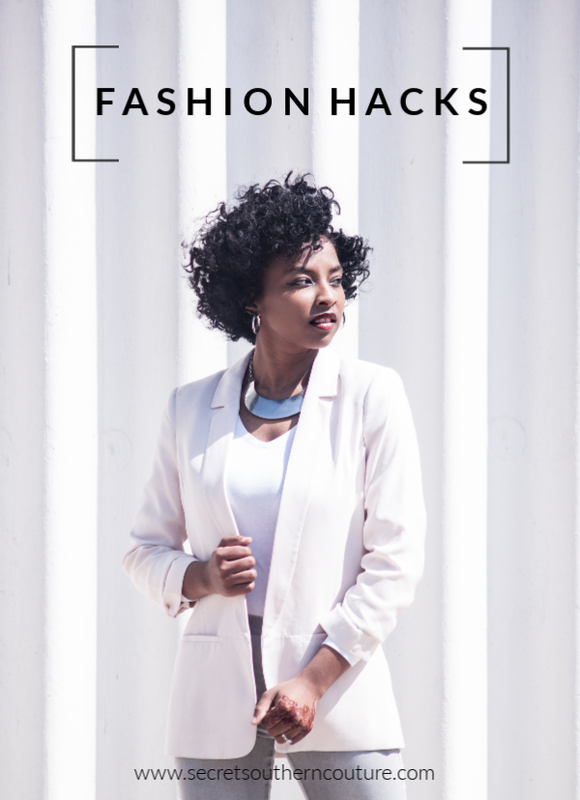 This look is inspired by the lace edges of some bridal veils. With a steady hand, this should take about 15-20 minutes total to complete. Clean your nails with non-acetone nail polish remover or rubbing alcohol to remove any excess oil or debris. 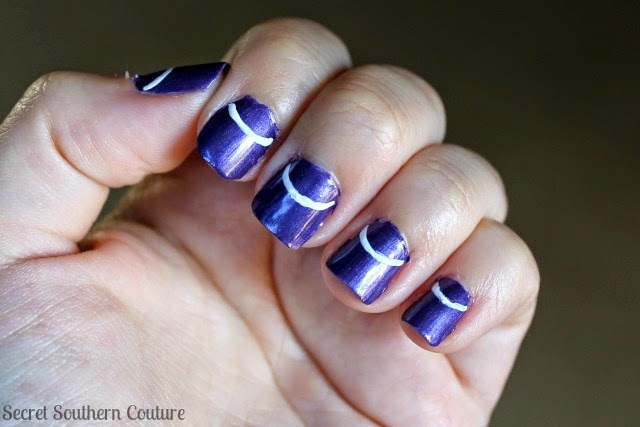 Apply your base coat and a layer of Colette (dark purple). If there's any on the skin, take a q-tip or extra brush dipped in polish removed to clean up the edges while you wait for this purple layer to dry. It should no longer be tacky before you move on. Apply a thin layer of top coat before doing the design. This helps to prevent smearing at the end. 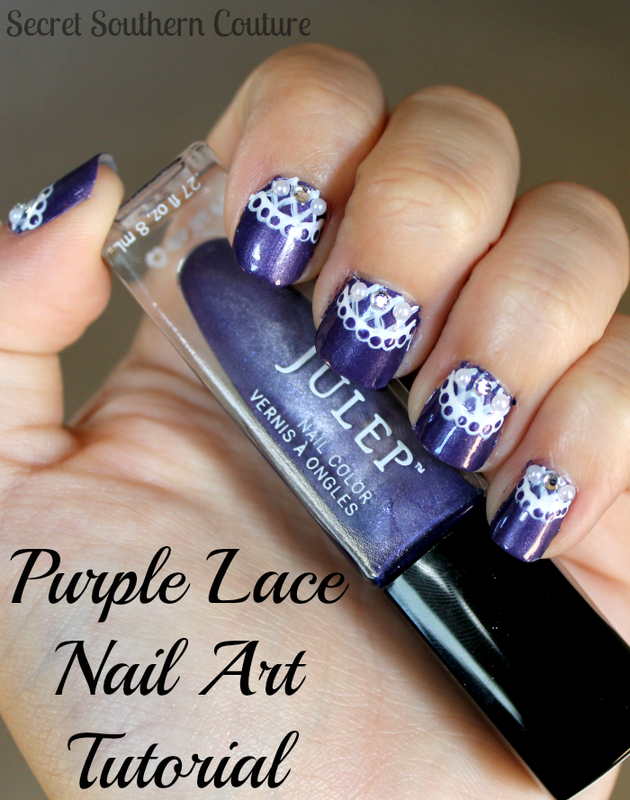 Draw a half circle across the base of the nail sectioning off how much of the nail you want to be lace. Use a tiny brush dipped in Bunny (white) for this. For short to medium nails you can start right at the cuticle. For longer nails, you can start this as far up the nail as you want. 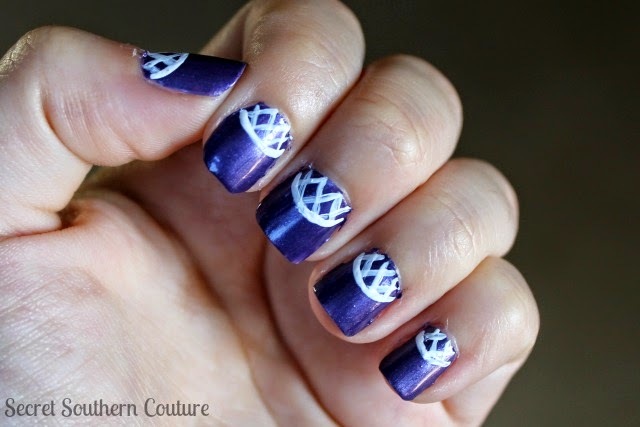 Again with white and the same brush as before, begin drawing lines in a criss-cross pattern going from the base of the nail up to the circle. If it goes over the circle a tiny bit, don't panic. This will be covered. Try to get all of the lines the same width by using the same amount of pressure. If the lines are proving difficult, you can create the pattern with striping tape and cut it to fit the space. Take a dotting tool dipped in white to create the bubbled border around the half-circle. You want each dot to touch on the sides and to not cross over the inner edge of the line. 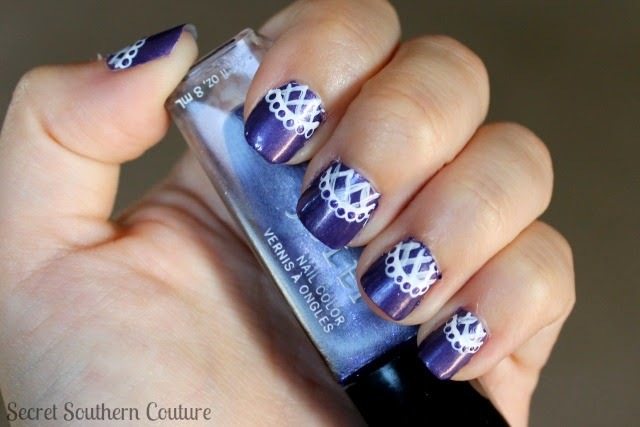 With a smaller dotting tool, place tiny purple dots into each of the white ones you just created. Leave a white border on every side of the purple and try to keep that border the same between each one. Finish this off with your top coat. To make this like the version in the first photo- At the base of each lace section, I placed one rhinestone and two pearl decorations. 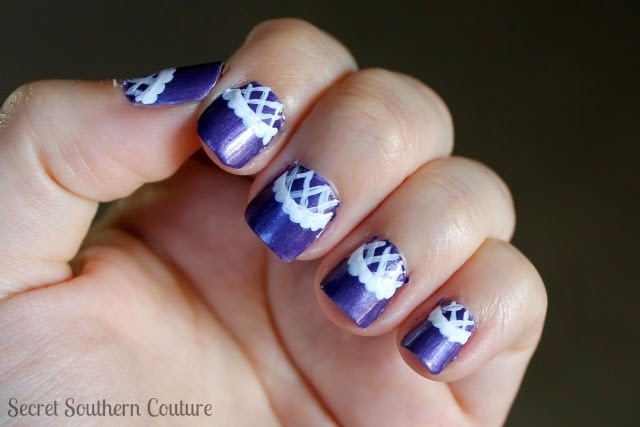 To do this, give the nails another layer of top coat and gently place each decoration into it while it's still wet. Let it dry and they'll be secured into the top coat.